"You want ME to do your taxes?!" 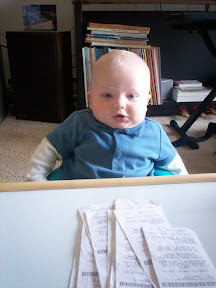 "How on Earth do you organize your receipts??" Actually, we used TaxCut Online to do our taxes. I'm sure Luca would have done a great job, though. 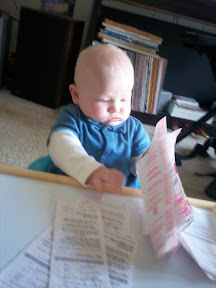 He did seem awfully interested in my W-2s while I was working on it. Maybe he just wanted to eat them though. TaxCut Online worked very well. For basic tax needs, it's quick and reliable. I spent about 2 hours working on it, and if there hadn't been a slightly confusing question about the Alternative Minimum Tax in Wisconsin, it probably would have been faster. Oh, and it would have been faster had I not been trying to complete it with my son on my lap, who likes to hit the mouse and keyboard! I also cleared my cookies on accident and had to log back in. Oops! I used the software last year and it went very smoothly this year with the addition of my wife's tax information and our new deductions for our son. The software remembers data entered from the previous year and restores specific answers from last year's return for review. It does not allow a direct import of last year's data without review as a safety mechanism. All in all, I could probably have saved a buck and done it on my own for the State and Federal taxes, but having the software to check over your work and the addition of on-demand support and assistance in case of an audit is a definite plus. Last year I did both TaxCut and the free State submission form, and I discovered that there was a difference in the return that was exactly the amount I paid for use of the software. There is a discout for tax preparation that TaxCut submits with you taxes! Submitting taxes online is also incredibly fast. We received our State return in less than a week and our Federal return will arrive 9 days after I submitted it. Overall, I would definitely recommend this software to anyone willing to submit your tax information on the internet. Of course, if you have a complicated tax return, a professional is always the best and safest bet.